Beautiful Flowers are one of the most beautiful creations of nature. They are always used to show our emotions and feelings. Let me ask you a question, Which is the most beautiful flower in the world I know you are confused because all the flowers seem beautiful and it is very difficult to list the most beautiful flower in the world. Flowers are one of the easiest ways to bring a smile on someone face. Flowers not only used for the anniversaries, birthdays or weddings present because of their beauty and fragrance. Flowers are also used for making a different kind of medicines. So, here we are listing 10 most beautiful flowers in the world. Undoubtedly this is the most beautiful flower in the world. I guess you all have heard them and also experience the fragrance and beauty of the flower. It comes in many different colours. The people have divided the different colour of roses into different feelings like Red is for love, Yellow is for friendship and the list goes on. Whether it can be any occasion but the roses would be a part of that because of their beauty and fragrance. Roses have about 2830 species and have many shades of white, yellow, pink, red, orange and even green. Almost all the species are found in Asia but some of them are native from North America, few European regions & Northwest Africa. Historically, roses have its importance for the Romans and they use it for decorations and even string them around the neck. Also, it has been said that “under the rose” was deemed to be a secret. During the 15th century, the flower has been given a name “War of the Roses” where the white rose has been epitomized Yorkshire and the red rose symbolised as the red rose branded Lancaster. It is also one of the best wedding flowers in the world. You will also like reading about beautiful roses in the world. Tulip flower is also one of the most beautiful flowers in the world. It belongs to the Liliaceae family and has 109 species. It is very common in the mountains. It is believed that the flower has been originated in the Netherlands. According to the historians, it was the Ottoman Empire who commercialized the flower. One of the most attractive flowers in the world is mostly grown and exported from Holland. The beautiful flower is available in a wide range of colours like pink, purple, orange, white, black, red and list goes on. Next to roses, they are the second most popular flower in the world, however, the average lifespan of the flower is around 3-7 days. The flower is also known as the token of passion and love. Almost all species of tulip can reach upto 2.7 to 4 inches in height and colour of the flowers depends on the variety. The name of the flower comes from the Turkish language where it is designated as the national flower of the country because Turkish means “turbin” and flower looks similar to unique-looking Turkish hat. The flower species has 2 and 6 leaves, however, some has even 12 leaves. The leaves are strap-shaped and covered with wax and are spirally arranged on the stem. The plant is developed from the bulbs located 4 to 8 inches under the ground. The average lifespan of teh plant species is 3 to 7 days. Dahlia flower can’t be missed if we are counting the most beautiful flowers in the world. There is a tale behind the name of the flower. During 1751, there was a student named Anders Dahl who used to be Carl Linnaeus favourite student. He died at the age of 38. Carl Linnaeus then decided to do some special for his favourite student. He named Mexican flower after him as an honour. Then the name of the flower has been changed to Asteraceae to Dahlia. They used to come in many shades but the blue one looks very beautiful. It is also declared Mexico’s national flower. Dahlias are considered one of the spectacular garden flowers. Dahlias grow from tubers in the ground similar to potatoes and there was a time when it was eaten also. It tastes similar to carrots. They were viewed as a vegetable until the 19th Century when Belgian gardeners grow different varieties with beautiful flowers. There are approximately 30 species of dahlias and 20,000 types. The beautiful flower comes in every colour but black and blue look exceptionally beautiful. The plants vary in size with some being 2 metres tall, however, others being 30 cm. Dahlias are asters and belong to the same family as daisies and sunflowers. The flower species were mostly seen in mountainous regions of Mexico, however, they are also common in warm countries. As of now, there are 30 species and 20,000 cultivars of Dahlias. Jade Vibe is also one of the most beautiful and rarest flowers in the world. It is found exclusively in the Philippines. In the Science language, it is called Strongylodon Macrobotrys. The flower colour varies between mint green & blue-green. It can grow up to 3 meters in height and have beautiful petals around the flower. The beautiful flowers are most commonly used as a decorative climbing plant sure to its beautiful colour combination. The flower has been listed as vulnerable because of deforestation and decline in its natural pollinators that feed on the flower nectar. The plant can grow up to 18 metres (59 feet), however, large flowers can reach up to 3 metres (10 feet) in length. One of the beautiful flowers mostly blooms during the winter and spring and emit a sweet scent that attracts butterflies, wasps, flies, bees for pollination of this plant. The flower species grows via seed and stem and leaf cuttings. It is named after the jade-like and dark green colour of the leaves. The plant has a long lifespan of 2 years because of its ability to store water in the leaves, stem and root. The African tribes eat the root of the plant and leaves can also be used in the treatment of diarrhoea and epilepsy and for the purification of the body. These flowers are exclusively found in Japan and have an extraordinary blossom. They usually grow in the spring season and come in white & light pink. If you are planning to go to Japan in the spring season you must be fascinated by the blossom of the flower in the country. It is additionally known as “Sakura” in Japanese and symbolised as renewal and hope in the country. One of the best places to see cherry blossoms around the world and the best time to visit it from late March to mid-April. People love to sit underneath the cherry trees and enjoy the beautiful view of the blossom. Japan’s national flower stand for renewal and hope. There is a century-old custom known as “hanami,” that signifies flower viewing. Early scriptures clearly show the tradition of emperors and members of the Imperial Palace Picnicking beneath cherry blossom trees. The Japanese people hang paper lanterns for late night picnics known as “yozakura,” and it looks exceptionally beautiful. The flower is a symbol of friendship between US and Japan and later Japan sent the trees to the U.S. to represent goodwill. It is believed that the Cherry blossoms are native to the Himalayas and they have originated somewhere in Eurasia before they came to Japan. The flower comes in the orchid family also a history attached to it. Initially, these flowers have been found in Europe and the United Kingdom. Due to many changes in the environment, weak adaptation is the reasons for the extinction of the beautiful flower. Now the beauty of the flower lies only in photographs. The flowering plant love to grow in a moist or little dry climate. Talking about the appearance, the edge of flower sack is quite slippery so small insects can get easily trapped in the flower because they were not able to find their way. These flowers are termed as the natural hearts of Nature. These flowers are really very beautiful as you can see in the picture. Since they look like a heart they are also called Bleeding Heart. These flowers must be your choice if you are planning a beautiful garden. They are found in three different colours red, white and pink. They usually bloom between April and June. The flower is listed as one of the popular ornamental plants additionally known as Dicentra spectabilis mostly seen on the Asian continent. The flower is quite famous for its unusual heart-shaped flowers and beautiful leaves. The most important thing is that all parts of this plant is poisonous and can cause skin irritation. You all need to be careful while handling the plant. The flower comes in many varieties and most common are fringed leaf bleeding heart, western Fringed leaf bleeding heart and dicentra cucullera. The flower looks like a parrot’s beak as you can see in the picture also the name comes from this characteristic of the flower. The flower is also very colourful with dark orange petal and red tints at its tips and a yellow base. One of the most beautiful flowers is native to the Canary Islands, located off the north-west coast of Africa. Scientifically known as Lotus berthelotii and comes from the family Fabaceae(family of legumes). The flower blooms are red to orange coloured and look very similar to the beak of a parrot. Additionally known as ‘coral gems’, ‘pelican’s beaks’, ‘lotus vines’, ‘cat claws’, and ‘pigeon beaks’. It can grow up to the height of 15 to 30 centimetres (6 to 12 inches) and spread in diameter approximately 61 cm (24 inches), however, the condition should be it should be ingrown on the ground. The best weather to bloom is during late spring and early summer months. During the spring season, all the European woods are densely covered with these flowers that look very beautiful. It is believed that the 19th-century poet named the flower. They basically represent regret and solitude. Additionally known by names such as Common Bluebells, English Bluebells, British Bluebells, wood bells, fairy flowers and wild hyacinth and it has been voted as the favorite wildflower of England back in 2015, however, Scottish, Welsh, and Northern Irish voters preferred the pale yellow primrose. The flowering plant grows well in old, dense woodland because the thick foliage limits the growth of other competing flora. The British Bluebell in the UK is protected by law under the Wildlife and Countryside Act 1981. It will be a criminal offence if you uproot the plant in the wild where it grows naturally. Even trade of the common bluebell bulbs or seeds will be fined up to £5000 per bulb. The English Bluebell’s sap is sticky and it is a natural glue for flight feathers to arrows fired by medieval archers and hence it is an important ingredient for winning medieval wars. The flowering plant is on the verge of extinction and hence they are very expensive. They are usually found in Sri Lankan forests and they blossom only in the night time. The bloom of the flower is also very rare and it is dependent on many factors. Additionally known as Kadupul Mal or Flower from the Heaven in Sri Lanka and Brahma Kamalam in India. Also, the flower has a rich history in Japan where they are called the Gekka Bijin or “Beauty under the Moon”. The Kadupul Flower range can extend from Mexico to Venezuela, as well as Brazil. It is also cultivated in some in parts of the USA with warmer temperature such as Texas or California. One the beautiful night blooming flowers is a rare plant and it cannot be picked without causing damage to it. Orchids are one of the oldest flowers in existence and there are numerous varieties of orchids in the world. It is also believed that the orchids are on the planet before the continents are separated on planet earth. Currently, there are 2500 documented varieties of orchids can be seen across the globe. This also gives us facts that one of the beautiful birds are four times the number of birds on the planet. It is grown well in tropical regions, however, the flower can be seen on every continent of the world except Antarctica. The bloom of the orchid is heavy enough to hang them down towards the land that makes them more beautiful. One of the most beautiful flowers in the world always gives a feeling of positivity because of its beautiful yellow bloom colour. The flower is native to the Americas and since ages, it is being used as food, medicine, dye and oil. The whole sunflower is made up of many tiny blooms and at the centre of the flower seeds develop and these tiny blossoms are loved by bees during pollination. 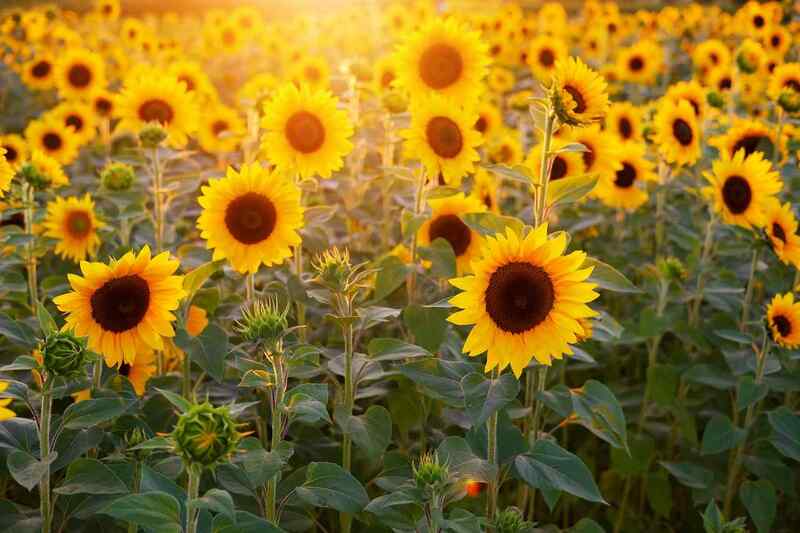 The plant of sunflower grows between 5 and 12 feet tall and can reach full size in a span of six months. The state flower of Kansas and it is also listed as the national flower of Ukraine. The most unique feature of sunflower is that it can remove toxins such as lead, arsenic, and uranium, from contaminated soil making it more valuable. The beautiful flower belongs to the family Liliaceae and there are numerous species of lilies seen mostly in Europe, Asia and North America. One of the beautiful flowers in the world grow best in temperate and tropical areas and loves to thrive in marshes, mountains and forests. The plant can grow upto 2 to 6 feet in height and lily develops from the bulb that can be easily located on the surface of the ground or it can be grown inside the grown as well. The flowering plants dormant during the winter season and flowering takes place in the spring and summer. The beautiful flowering plant can survive more than two years in the wild. One of the beautiful flowers from the family Asteraceae can be seen mostly in Mexico and South America. It is believed that the marigold can be cultivated since the 16th century and later Spanish explorers brought the beautiful flower from South America to Europe. The plant can reach upto 6 to 48 inches in height, however, it depends on the variety of the plant. The most common colours of the Marigold are yellow, orange, red and maroon in colour. The flowering plant has edible flowers and it is mostly used as an ingredient of salads and for the decoration of sweet desserts. The floating beautiful flowering plant belongs to the genus Nelumbo. Also, known as Indian lotus because it is the national flower of India. It origins belong to Asia and Australia, however, it can be across the globe in the aquatic cultures. One of the beautiful flowers can be seen in shallow and murky ponds and lakes that can be exposed to direct sunlight. The flower cannot survive in colder climates and it can reach upto 49 inches in height and spread approximately 10 feet horizontally. The flower opens up in the morning and closes in the night. It is considered as the symbol of the sun and also created in ancient Egypt because of its behaviour that marks the beginning and end of the day. These are beautiful flowers in the world. Do post your comments.